The School of Marine Sciences has administrative offices in Aubert Hall on the Orono campus. Faculty offices and research laboratories are located on the Orono campus and at the Darling Marine Center. 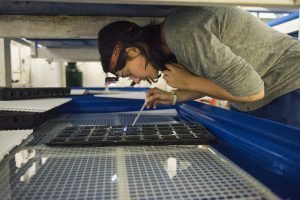 Facilities for teaching and research in marine science on the Orono campus are numerous and diverse. They are found in several buildings that house School faculty. Special instrumentation and facilities include: a scanning and electron microscopy laboratory; instrumentation for molecular biology and microbiology, including a central DNA sequencing facility; aquatic holding and recirculation systems; an oceanographic satellite receiving laboratory; and comprehensive computing support. Tide pool class at the Darling Marine Center. The Darling Marine Center (DMC) is located 105 miles south from Orono in Walpole, Maine, and sits on 170 acres bordering 2 kilometers of pristine water frontage on the Damariscotta River estuary. The DMC has a year-round population of 50 people, including 9 SMS faculty, along with staff and students. In the summer, the DMC population swells with undergrad interns, summer classes, and visiting scientists. Facilities include modern laboratories, classrooms, conference rooms, a marine library, flowing seawater laboratories a dormitory and dining hall, and cottage housing. A fleet of boats up to 42 feet long provides access to nearby estuarine and coastal waters. 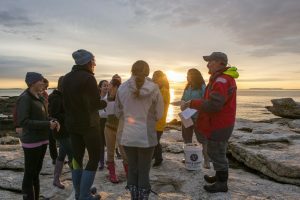 Several undergraduate and graduate courses are offered at the Darling Center each year, in addition to the Semester-by-the-Sea program. The Aquaculture Research Center (ARC) is located on the Orono campus and is part of the Maine Agriculture and Forest Experiment Station. The ARC provides faculty and students with artificial flowing searwater in a flexible lab setting. 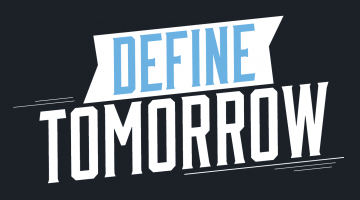 In addition to supporting faculty research and graduate thesis projects, the facility is used by undergrads for training and senior capstone projects. 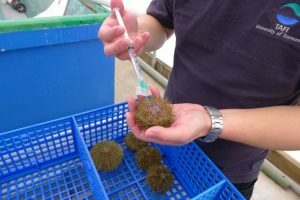 At the CCAR, ripe sea urchins can be induced to spawn with an injection of dilute potassium chloride. The University of Maine also has a coastal facility dedicated to aquaculture research, the Center for Cooperative Aquaculture Research (CCAR). The center has a director and a staff of six employees. CCAR provides facilities to faculty in the SMS invlolved with various aspects of aquaculture research. The Gulf of Maine Research Institute on the coast in Portland, Maine. 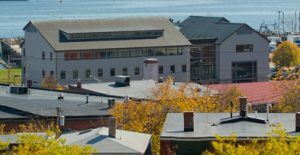 The University of Maine School of Marine Sciences also supports faculty based at the Gulf of Maine Research Institute (GMRI) in Portland, Maine. GMRI is a neutral, nonprofit organization that catalyzes solutions to the complex challenges of ocean stewardship and economic growth in the Gulf of Maine. GMRI utilizes a dynamic fusion of science, education, and community outreach to effect change from multiple directions while remaining committed to its core principles of objectivity and collaboration.